Every position is up for grabs at Nebraska under the new coaching staff, but for the tight ends group that would have been the case regardless of whether or not Nebraska made a coaching change. The Huskers lost 81 percent of their tight end receptions and receiving yardage with Tyler Hoppes graduating, and they lost an even higher percentage of snaps when you factor in Connor Ketter who was used primarily as a blocker. Jack Stoll (6-foot-4, 245 pounds) is the only tight end on the roster who has caught even one pass at the college level. He snagged eight balls for 89 yards and two touchdowns as a redshirt freshman last year. Prior to the start of spring practice, Beckton said Stoll sees himself as “the guy” and early returns have him backing up his words as he was the first name mentioned by Beckton on Thursday. Allen (6-foot-8, 210 pounds) and Rafdal (6-foot-7, 230 pounds) are the two tallest pass-catchers on the roster by far and are coming of a redshirt year. Engelhaupt is a 6-foot-3, 240-pound redshirt sophomore who has yet to see the field. The only tight end on scholarship Beckton didn’t mention is Matt Snyder, a 6-foot-5, 240-pound junior who has struggled to overcome injury issues. Walk-ons Bo Kitrell (a 6-foot-1, 235-pound senior) and Branden Hohenstein (a 6-foot-4, 220-pound sophomore) are the only other tight ends currently on campus. Beatrice native Cameron Jurgens, a 4-star recruit listed at 6-foot-4 and 245 pounds, and walk-on Bryson Krull, a 6-foot-5, 220-pound wide receiver out of North Platte who will change positions at the next level, will arrive on campus in June to bolster the depth of the tight end position. Scott Frost’s offense uses tight ends differently than Mike Riley’s did. The Knights had three tight ends play extensively last season and the trio combined for 69 catches, 856 yards and five touchdowns compared to 42 catches for 466 yards and five touchdowns for Hoppes and Stoll at Nebraska. Beckton said “playing in more space” is the biggest thing the tight ends have to learn to be able to make that transition. “They have to understand they have to control themselves a little more on the perimeter, understand how the defense is rotating on you and the biggest thing that we’re trying to teach those guys to understand pre-snap what’s going on in front of them so they can adjust a lot quicker than they have in years past,” Beckton said. Playing time is up for grabs at the tight end position this spring. 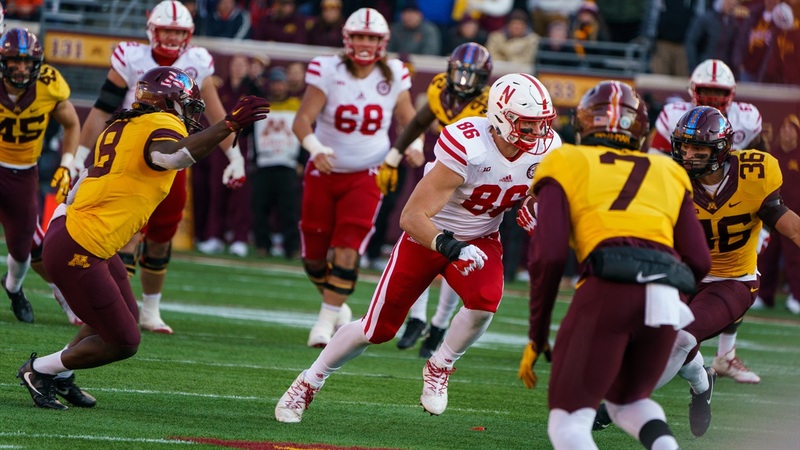 Jack Stoll has made a strong case for himself early on, but this is one position battle that should truly last throughout the spring and fall as Beckton searches for the best fits for Nebraska’s new offense.